My First Surgery (and it was a big one) | Run Inspired. 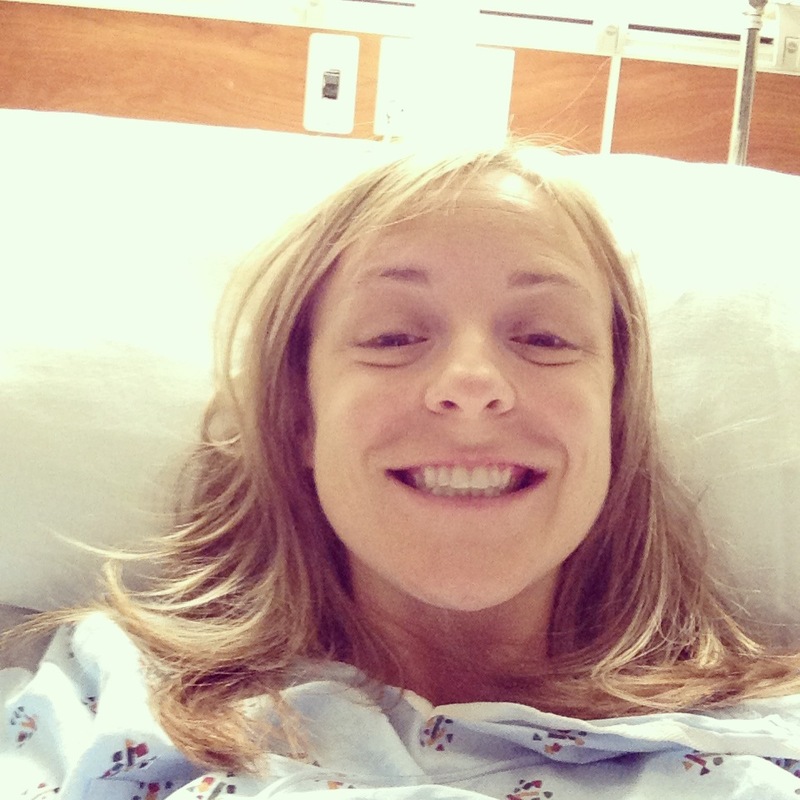 On Wednesday I posted that I would be headed into surgery in a few hours. It’s been four days since then and a lot has happened since April 30th. When the doctor told me I was going to have to have surgery immediately, I got a little nervous. After all, I still have my wisdom teeth and anesthesia was something completely foreign to me. But perhaps it was a good thing the surgery was that day. It didn’t get me much time to think about it. Or to get more nervous. Around 1:00 pm I started the check in process at the hospital. The man who checked me in asked me what was with this date and Rex hospital. Almost three years to the day, I had been in the ER at Rex hospital because I had fallen seven feet from a chair and hit my head and broken my collar bone. (And for those of you who don’t know, this happened on my wedding night. Note: a wine dinner is fun, but one must be careful.) By 2:00 I was back in pre-op being asked 1000 questions. 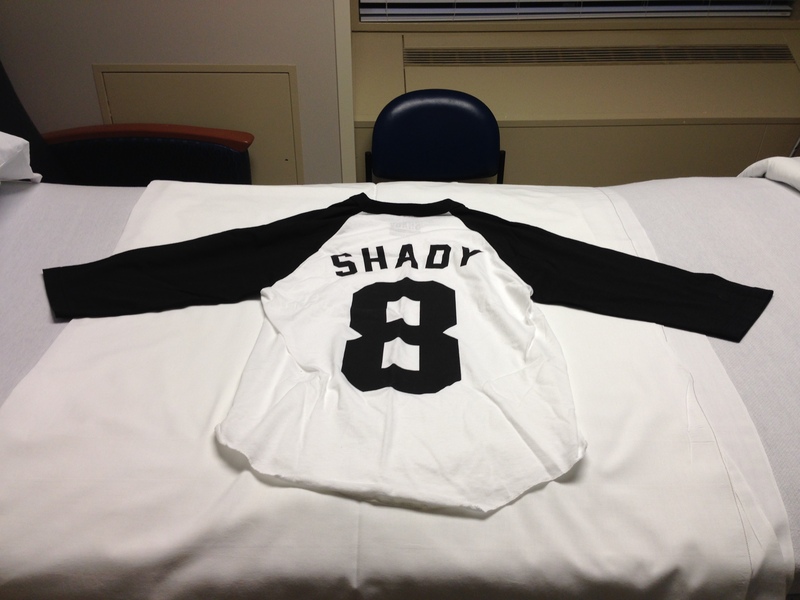 The nurses, however, made me feel like I was freakin’ amazing. When I told them how I fractured my hip and that I still walked 7 miles of the race, they started calling in other nurses so I could tell them my story. They told me I inspired them. It helped with the nervousness. Then they had me change into my lovely hospital gown and gave me an IV. I’ve never had an IV before and always dreaded getting one. After having had one, I can still say, I dread it. Yes, the pain eventually goes away, but the pressure for those first few minutes is so uncomfortable. I hung out in pre-op for almost two hours. Mario was there with along along with my good friend Nikki. She has been through several major surgeries so for 45 minutes I quizzed her on everything that may or may not happen. That helped calm my nerves. Around 3:50 I was wheeled to another part of the hospital where I would meet with the doctor, ask any questions I had, and then head into surgery. Mario and Nikki accompanied me along the way and I started to get a little more nervous. Surgery was scheduled to start at 4:15pm. The anesthesiologist came by and reviewed what she would be doing. We decided on spinal anesthesia because I didn’t want a breathing tube down my throat and she said it would be easier to wake up from than general anesthesia. Around 4:10 they wheeled me back to the operating room. I had already been sedated and was feeling a little loopy. Then the anesthesiologist told me to sit up and I don’t remember anything after that. Two hours later I woke up freezing, with blankets all around me, and hanging out with Jennifer (the nurse) in recovery. 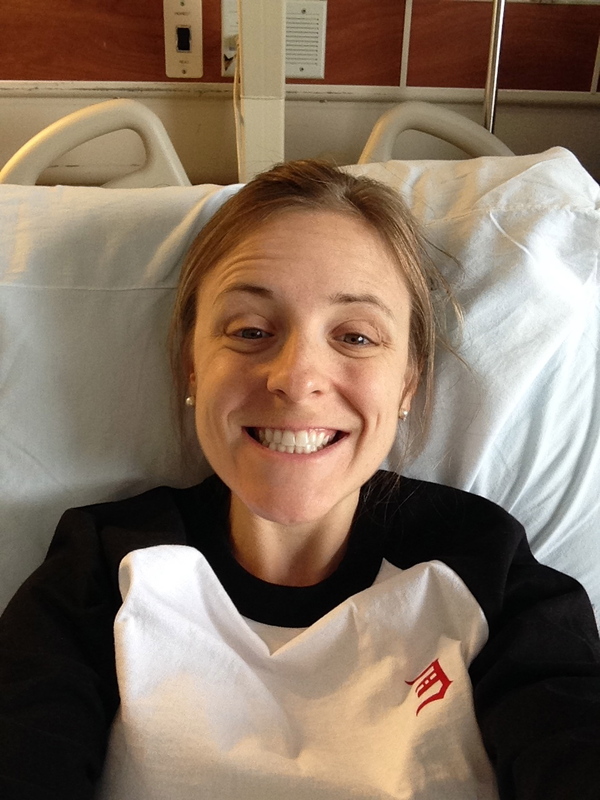 It made me smile when I heard nurses started asking me about how I ran the Boston Marathon with a fractured hip. They again told me I was awesome. Wednesday night was rough. From the moment they moved me over to the bed in my room, I didn’t move until the next day. I couldn’t scoot over, move my leg, or anything. For some reason, I didn’t even feel like I could move my arms. That entire night, I watched the clock. The pain was so bad that I couldn’t hardly sleep. Instead, I waited for every three hours to pass so I could get some more pain meds. There was one point when I couldn’t even wait the three hours and asked for morphine in between doses of oxycodone. Mario was kind enough to “sleep” in the recliner beside me but I think he got as much sleep as I did. By 6:00am we were up, and I still hurt. Around 10:30 by best friend Lesley came to visit along with my sister. Mario went home to shower and I stayed immobilized in the hospital. Then the occupational therapist came to visit me. Yes, I wanted to get out of bed. I wanted to move. But I wasn’t prepared for what I was about to experience. Debbie was very nice and very patient with me. Our goal was to stand up and then to sit in the recliner. Seemed simple enough but it was anything but simple. Getting my feet on the ground was hard, but standing up was harder. The moment I stood up, I started sweating profusely, the color drained from my face, I felt nauseous, and couldn’t breathe. I literally couldn’t breathe and it was scary. It was a feeling I had never experienced before and I didn’t like it at all. Debbie helped me to sit back down and gave me “the bucket” incase I got sick. Luckily, I didn’t. After five minutes, I finally caught my breath and tried again. This time was a little better and I made it to the recliner. Instead of going back to the bed, Debbie had me stay there for a few hours until Brian, the physical therapist, came by. Hip before: that gap shouldn’t be there and the femur should be at a 45 degree angle instead of an almost 90 degree angle. Too much pressure on my femur and my hip would have been completely broken. While hanging out in the recliner, I was still trying to recover from the move from bed to chair. Unfortunately, the pain meds, anesthesia, and surgery finally caught up to me, and I did get sick. Thankfully my sister was there to help me through it. When Brian came to visit me, I could tell he wasn’t going to be as sweet and patient as Debbie. (It was actually a good thing.) Before getting me to stand back up, Brain gave me a few isometric exercises I could do while sitting down. Then it was time to get up. Brian reminded me I could put full weight on my leg. Nothing was going to happen and my leg wouldn’t explode. I told him it hurt. He said it was okay and just to stand up. With the help of the walker, I made it up on my own. Brian and I walked 10 feet to the door and then 1o feet back to the bed. He made me sit down on my own and taught me how I could use my right leg to get my left leg into bed. That was the extent of my walking that day and I was exhausted. 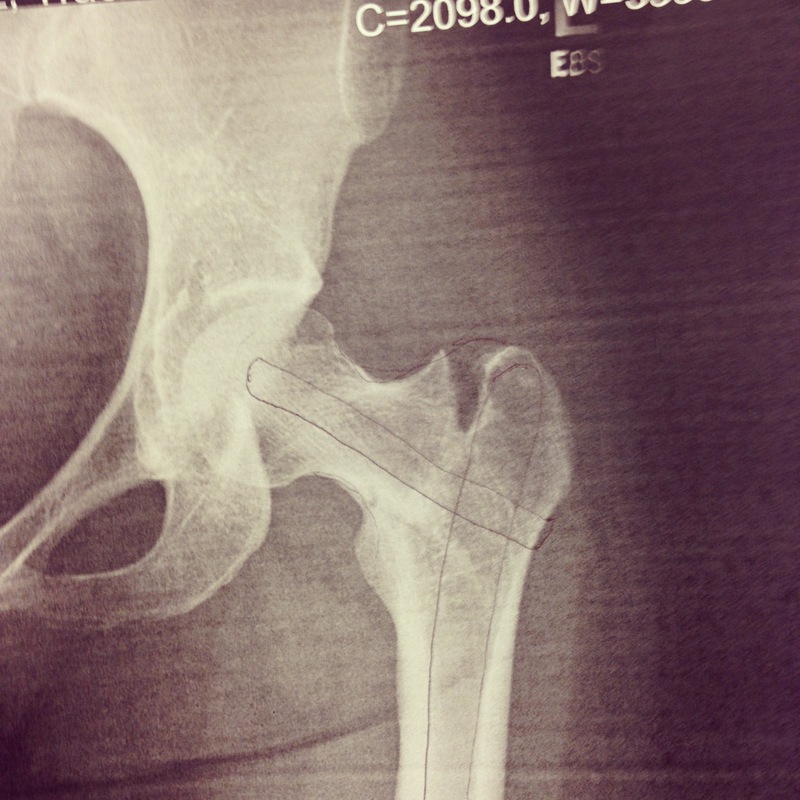 New hip! 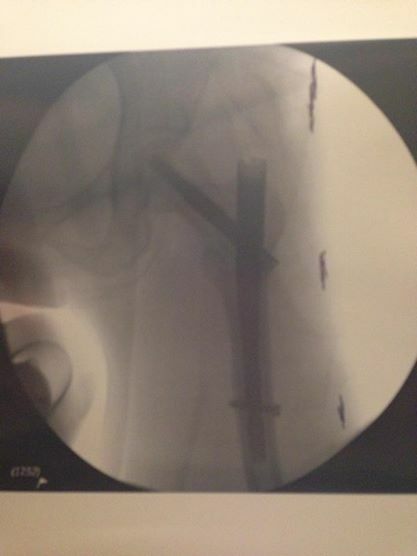 I have a rod and two screws holding the bones together.Notice that the femur is more down and at a 45 degree angle. Thursday night by neighbor Geoff came to visit. And to help Mario sleep a little better in the recliner, he brought a few delicious beers. Yes, I admit it. I had a few sips and it made the misery of being in the hospital one more night not so bad. I slept much better Thursday night. The pain was a little less and I could move a little more. I did still take my pain meds but not every three hours like the night before. Friday was my birthday and I felt just a little better than I did the day before. I’m a firm believer in everything happens for a reason. I’m not mad or upset this happened to me. It’s just something that happened and I’ll be just fine. The recovery period will be long but at least I know when this is all over, my hip will be stronger than ever before. In the meantime, I’m going to focus on swimming, biking, yoga, and weights to keep up my fitness. (Doc says I should be able to return to activity in 6 weeks.) I’ve always wanted to do an Ironman so maybe this will put me on that path. Thank you Lena! That means a lot to me. I’m doing my best to heal as fast as possible. It hasn’t been a week yet and I can already tell big improvements. That’s a plus :). I’ll keep everyone updated on the recovery process. Oh my god. What an ordeal. Do they have any idea how or why this happened?